An umbrella organization, STL250, is coordinating the anniversary celebration activities. It’s official! The Thomas Sappington House has been voted to be the site of a “Cakeway to the West” to celebrate the 250th anniversary of the founding of St Louis.This is a great honor for the Thomas Sappington House and the whole Sappington-Concord area. 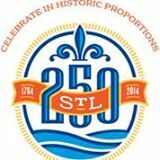 See the full list of sites on the STL250.org website.